Depending on what time of year you ask me, “What’s your favorite season?”, my answer will vary. See, in February or March, I would likely say that Spring is my favorite season, because I’m not a huge fan of cold weather – especially if it didn’t produce a beautiful blanket of snow to play in outside or look at from indoors. I love the warm temperatures, the new spring colors, and the season of Easter. However, if you ask what my favorite season is this time of year, I’d say it’s Fall, because it’s much like spring – nearly perfect. I love the brisk temperatures, the colorful foliage, and, of course, football season! So as far as I’m concerned, Spring, Fall, and Winter are all my favorite months. Oh, wait! How could I forget about the adventures of summer. When you subtract the oppressive heat, that is another favorite season. No school, few activities, summer travel, lots of time spent with family, and relaxation makes me one happy Best Books Network! Hmm, I guess my favorite season is all of them! 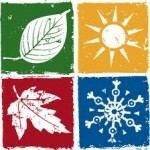 What is your favorite season and what do you like about it?